Today I was going through recovery models so thought to share different ways how we can find recovery models in SQL Server 2012. Execute below query in query editor and find the recovery model. Execute below query and check the recovery model in STATUS column. You can find the Recovery model through SSMS also as given in below path. 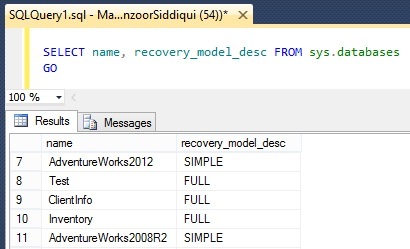 In Object Explorer, Select Databases node and Press F7, you can find the recovery model under Recovery Model column. Put your database name in query and execute. SELECT DATABASEPROPERTYEX ('DBName', 'RECOVERY') "Recovery Model"
Right click on database and select Facets and you will find the detail in recovery model property.